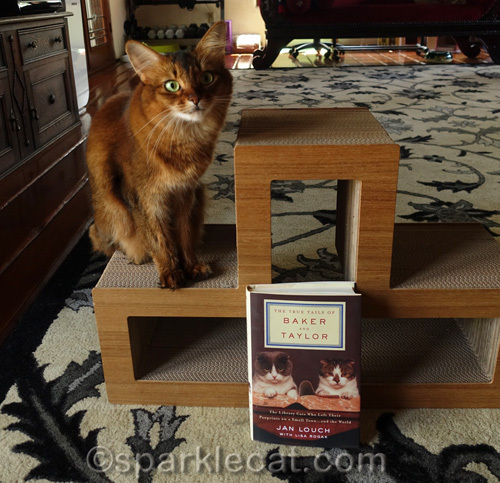 You are here: Home / Book Reviews / About the Library Cats Baker and Taylor – and a Giveaway! 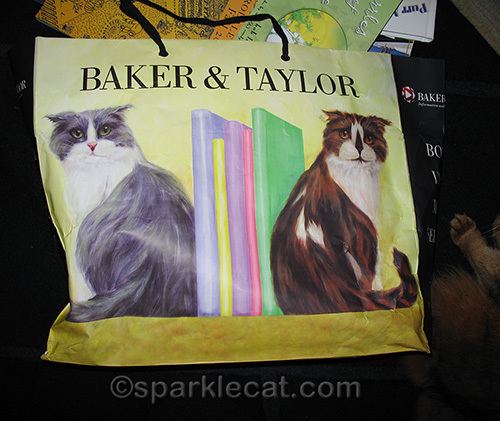 About the Library Cats Baker and Taylor – and a Giveaway! As you know, I have a soft spot in my heart for working cats (since I am one myself), and especially for library cats. So did Sparkle. 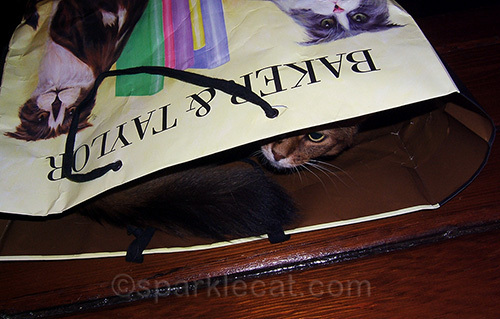 Back in 2008, my human went to Book Expo America, the largest annual book trade fair in the U.S., and she came home with this bag with two mysterious cats on it. Somebody did write a book! More specifically, Jan Louch, the librarian responsible (along with fellow librarian Yvonne Saddler) for bringing the cats into the Minden library, naming them after the company, and caring for them throughout their lives. 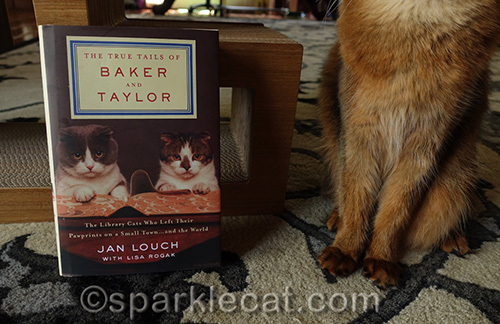 The True Tails of Baker and Taylor is the story of Baker and Taylor, the cats, and the magic they brought not only to their own library, but to libraries and cat lovers throughout the world. It is also the story of a library in a small, rural western town, where cats mostly lived in barns and few people had ever seen any fancy breed cats. While nowadays, library cats are more likely to be rescues, back in the 1980s, Jan and Yvonne happened on the perfect breed for the job. Scottish Folds are sweet, docile cats. They have easy going natures and enjoy human company. The library hadn’t been looking for cat employees — Jan and Yvonne, both cat lovers, just decided one day that the library should have a pair, and they set out to make that happen. When Baker and Taylor (the company) discovered that the two librarians had Baker, but hadn’t saved up enough for a Taylor (they were paying for the cats out of their own pocket), they offered to pay for the second cat. They also put the cats on posters and merchandise, which were instant hits among librarians everywhere. Not only did the Minden library’s popularity increase among the town’s residents, it became a popular place for tourists, who wanted to see Baker and Taylor in person… in catson? I can never figure out the right way to say that. While most of the book is fun and heartwarming, it’s not without its tears… we kitties don’t live forever. One of the nice, but bittersweet surprises was that there were several interviews with library cats in the book, and the very first one was with our old pal, Tober, the Thornton, Indiana library cat who passed away last November. I think that if you love cats and books (and libraries! 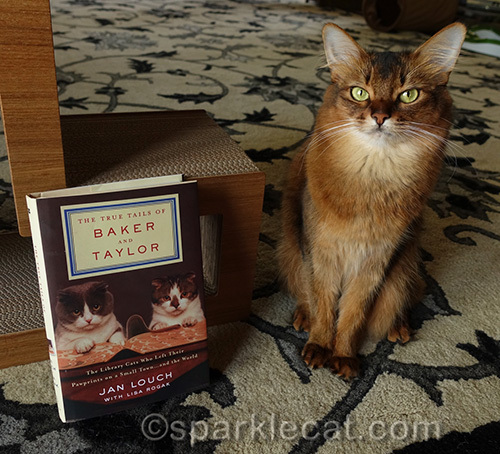 ), you will love The True Stories of Baker and Taylor… and I have a copy to give away! It’s a U.S. only giveaway, but if you live somewhere else in the world, you are welcome to enter and have the book sent to a friend who lives in the U.S. You can enter using the Rafflecopter widget below — good luck! Disclosure: The Amazon link to The True Stories of Baker and Taylor is an Associates link, and I will get a small commission if the book is purchased through it. I had not heard of Baker and Taylor, I will diffently read it. Instead of “catson”… try “in their feline glory.” In Fairhope, alabama, there are several antique shops who have their resident felines. OK, I *need* this book. I have been a librarian for 42 years. When I first started working at my library in 1973 we had initiated a blanket order program with… Baker & Taylor. Working with the program was one of my first responsibilities. And that poster from the 80’s? I have that exact one on the wall of my office. I saw it at a yard sale (to benefit the campus cats, no less) and immediately grabbed it, of course. Yes, Summer, if I don’t win the book I will be buying it. I’ve met many wonderful bookstore cats, but never any in a library. What great book! I, too, would love to see more cats in libraries. As my favorite cat drawer Edward Gorey said, â€œBooks. Cats. Life is Good.â€ I’m sure libraries count in there too. That sounds like a fun book. And there’s an interview with Tober in it? We miss Tober. That’s so cool! I remember seeing posters of Baker & Taylor when I was a kid. We would love to see more cats in libraries! It is a great way to educate children about compassion toward animals. We luff the idea of cats in libraries. Baker and Taylor are pawsome! I am reading their book right now. 🙂 I’m a super slow reader (a rather aggravating quirk of mine), but I will be done soon. These kitties are so cute and touching!